Tonight I stopped by an AMOS presentation at which some of our top climatologists talked about the state of Australia's climate. (Thanks all.) The strongest message was about where our climate is heading. If the numbnuts at WUWT and Jo Nova's place and those who float around Andrew Bolt's blog waiting for a chance to proclaim AGW is a myth had seen what these people see, they'd be marching the streets campaigning for Tony Abbott to get off his bum and do something to cut carbon emissions. Here is a slide that Dr Sophie Lewis of the University of Melbourne put up. She explained that she and David Karoly ran some experiments that demonstrated that the chance of having a year like last year in Australia without AGW would have been once only - in 13,000 years! And last year wasn't even an El Nino year. Later, she told us that years like last year's record hot year will be the norm by 2050. By the end of this century, years like last year will be considered cold. Well, not cold of course, but a reprieve of sorts from the stinking heat that will be the norm if we keep emitting CO2 at the rate we are. 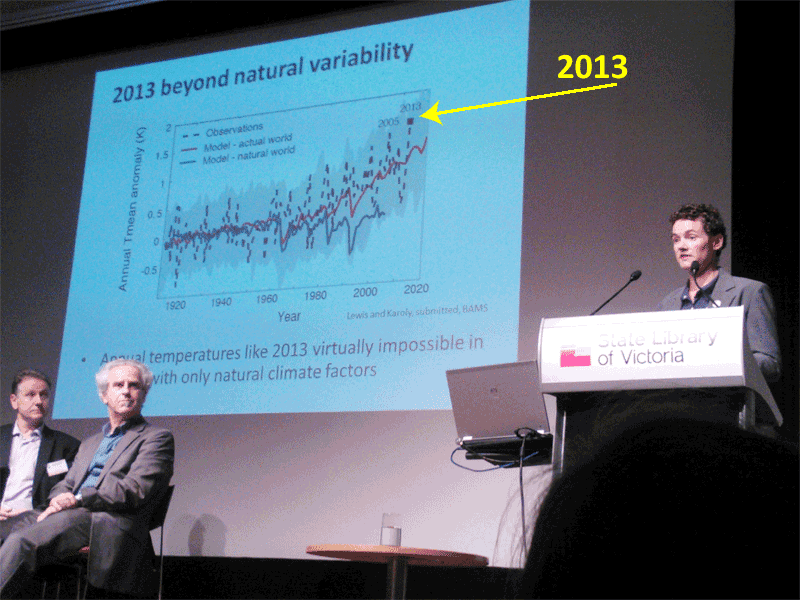 How the record hot 2013 will soon be the norm and by 2070 will seem "cold"
Other speakers were Dr. Karl Braganza (BoM), Dr. Scott Power (BoM), Dr Penny Whetton (CSIRO) and Dr. Ailie Gallant (Monash). I was held up at a meeting and missed Karl and Scott's talks, but Ailie's presentation was every bit as good as expected and so was Penny's. It's one thing to read reports like the State of the Climate 2014. It's quite another to see and hear climate scientists discuss what is happening. We know what is happening because we are living it. But seeing what's before us is something else altogether. Here is a graphic from the State of the Climate report, showing how much different parts of the country have warmed over the past century or so. 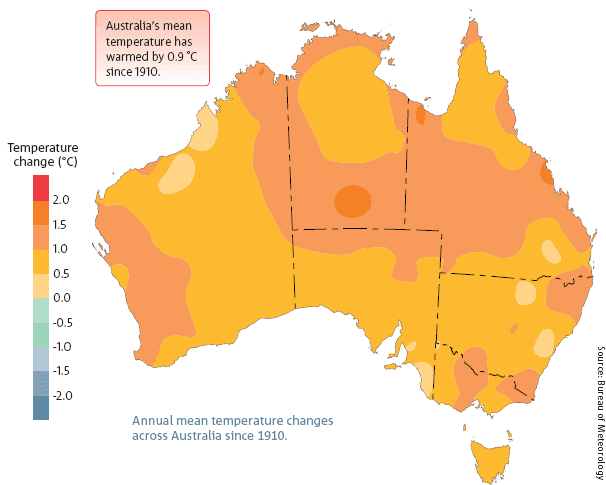 Australian temperatures are projected to continue to warm, rising by 0.6 to 1.5°C by 2030 compared with the climate of 1980 to 1999; noting that 1910 to 1990 warmed by 0.6°C. Warming by 2070, compared to 1980 to 1999, is projected to be 1.0 to 2.5°C for low greenhouse gas emissions and 2.2 to 5.0°C for high emissions. There's a chance of Australia being five degrees Celsius hotter by 2070! Sheesh. Last year was bad enough, I cannot imagine the world that my great nieces and nephews and their children will have to learn to live with if we keep going the way we are. We live down in the south east corner - the bit where it says "very much below average" to "lowest on record". With an El Nino maybe coming, I figure it's time to get the water tank connected properly. 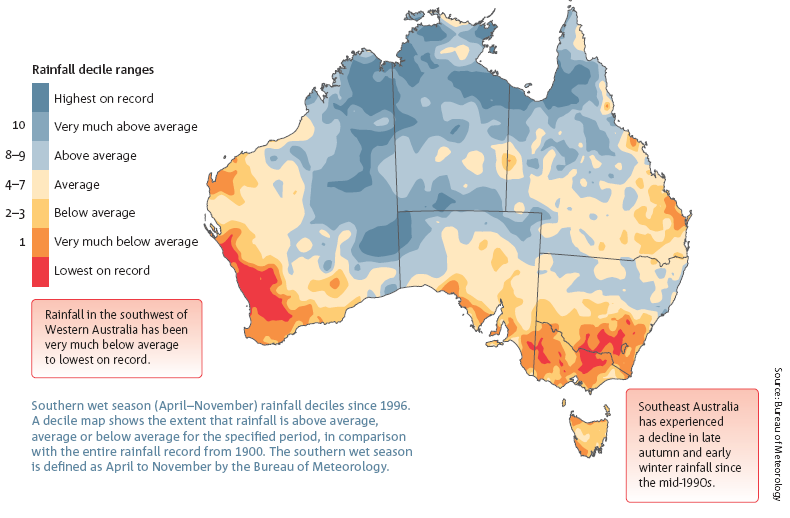 In south eastern Australia it's going to continue to get drier and hotter. Could be a drought coming, it might not be this year or next. Then again, it might. Time to resurrect that old motto: "Be prepared." Coincidentally at the same time that you were attending this event I was listening to Jim Salinger give a talk about Australia and New Zealand in a warming world. He also referenced the State of the Climate 2014. I've been to enough of these presentations to have reached the conclusion that the modelled result of human carbon emissions is effectively inevitable. The message has been the same for almost a quarter of a century during which I've heard the science on climate change discussed, and there has been no effective response from our societies or from governments... the last Labor/Green government's desultory effort excepted. Jim mentioned Helen Clarke's answering of a question in New York, where she said that change required strong leadership and strong community support at the grassroots. From where I stand it seems that the sad fact is that we have neither, and the current trend in societal attitudinal change around the world will see little to no effective response over the coming decades if it follows the trajectory of what has occurred to date. The changes that I do see are the growing quiet desperation of my scientific colleagues, and the growing frustration of the minority of the population sufficiently informed to understand the impending boot to the head but insufficiently influencial to be able to effect a broader understanding and response. "Ahhh! Woooh! What's happening? Who am I? Why am I here? What's my purpose in life? What do I mean by who am I? Okay okay, calm down calm down get a grip now. Ooh, this is an interesting sensation. What is it? Its a sort of tingling in my... well I suppose I better start finding names for things. Lets call it a... brain! Yeah! Brain! And hey, what's this roaring sound, whooshing past what I'm suddenly gonna call my head? Wind! Is that a good name? It'll do. Yeah, this is really exciting. I'm dizzy with anticipation! Or is it the wind? There's an awful lot of that now isn't it? And what's this thing coming toward me very fast? So big and warm and round, it needs a big warm sounding name like 'Ow', 'Ownge', 'Round', 'Global Warming'! That's it! Global Warming! Ha! I wonder if it'll be friends with me? Hello, Global Warming!" Knowing what they know I don't know how climate scientists maintain their sanity. All of you who've studied climate and related topics must think we in the wider world are insane, living in a world of make-believe. At tonight's presentation there was a bit of discussion in the question time about why more wasn't made of the fact (in the State of the Climate report) that it's us who are causing this to happen. In some sense I can sympathise with those scientists who decided not to make too much of that fact. Not the panel members, by the way - some of them agreed that the report should have made the point more forcefully. However having seen the presentations and just how alarming the situation is, it is a real balancing act. How to make people realise what we're heading for without sending them into blind panic. I don't know the answer to that one. However tonight's presentation hit home forcefully. Here are a couple of articles on climate communications. Both make the point that the message has to be connected to **people**. ie how climate change will affect us and our families and how we live and work. Sending people into a blind panic has not been the issue to date - most of the messaging has been "brightsiding" e.g. the Gillard government campaigned on clean energy rather than pointing out that a carbon tax was introduced so that we could avoid the downsides of climate change. The successful health campaigns - smoking, drink driving etc deliberately set out to scare people (with accurate science). On the other side, Abbott's successful campaign against the carbon tax was designed to send people into a "blind panic" over cost of living. Here is an interview with CCA chairman Bernie Fraser who nails the political problem in Australia - there are too few ALP politicians who are prepared to take on the cranks in the Abbott government over their climate lies. Chemtrail Kooks? 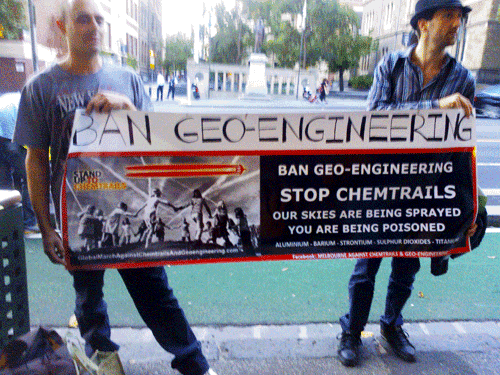 You deny the reality of geo-engineering? even prof david keith of the IPCC says a small island nation can control the worlds weather, mega tonnes of aluminium and aluminium oxide aerosols have been around for years, aluminising the atmosphere and soil. Why is this not considered in sophies studies of anthropogenic aerosols?? I learn something new every day. I did a quick search of David Keith and he studies geo-engineering possibilities. He's been misrepresented on zillions of websites along the lines of contrail hoax's comment above and worse. Truly, there are a lot of nutters in the world. Is it because they regard modern life as too bland for them? Paranoia freaks looking for something to feed their addiction. There is enough real stuff to be concerned about without making up stuff. BTW any more nonsense from chemtrail kooks will be deleted. Comments haven't disappeared completely, they've just been moved. No promises for future comments. Try prison planet or info wars if you want to discuss chemtrails. Last night I attended the Amos presentation and found it very sobering and interesting. The average person seems unaware of the drastic climate shifts happening now in Australia. As a grandmother I feel a sense of urgency for people to wake up and do whatever it takes to reduce man-made pollution. Unfortunately the hour is late and safe green energy inventions and schemes have been held up by greed and other factors. Sorry my full comment had to be split in two. This is the other half. In the light of this study this can’t be ignored. Something has drastically changed in our skies and many ordinary people like me are seeing it and becoming more and more alarmed. Anyone who is older than 5 living Down Under will not be able to remember, ever seeing these persistent contrails that spread into haze all over the sky now. 13/03/13 was a shocker in Melbourne - planes leaving trails all over the sky spreading into haze and eventually turning the sky a faded blue. Could this be one reason for rising night temperatures over Australia? Persistent haze traps heat on the earth's surface at night time and reduces sunlight during the day. As an artist I have photographed the sky for the last ten years and have found no evidence of these trails till I saw my first one April 2012 - I have not stopped photographing them since. If this is not geoengineering what has changed in jet fuel and why? There needs to be an urgent investigation into this phenomenon. I have personally approached MPs with time lapse photographs and get the same response each time - increased air traffic or vapour trails. After 17 years of living under a direct flight path in Auckland till 3 yrs ago I never saw one persistent trail. On a trip across the Tasman last July to Auckland the sky was full of trails and a dirty haze at 34,000', way above the clouds. I felt sad about what man is doing to our world. I have been travelling between the two countries for 7yrs and had never seen such a mess up in what was once clear blue sky. Is this the elephant in the room / the emperor with no clothes? In the future I hope you will do some modelling along the same lines as the German scientists. The government does needs to wake up - and so do all the people. We can all do a little down here where we live to save the planet, but we can’t control what goes on in the sky. I suggest you don't call concerned citizens Kooks who can see something is going on but don't understand all the science. Maybe time to think outside the box where ordinary people live. Thanks to all the speakers for sharing their research with us last night. Aviation jet engines emit hot moist air, which can form line shaped persistent condensation trails (contrails)in environments that are supersaturated with respect to ice and colder than about –40C. The contrails are composed of ice crystals that are typically smaller than those of background cirrus (Heymsfield et al., 2010; Frömming et al., 2011). Their effect on longwave radiation dominates over their shortwave effect (Stuber and Forster, 2007; Rap et al., 2010b; Burkhardt and Kärcher, 2011) but models disagree on the relative importance of the two effects. Contrails have been observed to spread into large cirrus sheets which may persist for several hours, and observational studies confirm their overall positive net RF impact (Haywood et al., 2009). Aerosol emitted within the aircraft exhaust may also affect high-level cloudiness. This last effect is classified as an aerosol-cloud interaction and is deemed too uncertain to be further assessed here (see also Section 7.4.4). Climate model experiments (Rap et al., 2010a) confirm earlier results (Kalkstein and Balling Jr, 2004; Ponater et al., 2005) that aviation contrails do not have, at current levels of coverage, an observable effect on the mean or diurnal range of surface temperature (medium confidence). I reserve the term "kooks" for the people who talk of "chemtrails" not contrails. In my experience at HotCopper, these "kooks" are also likely to believe that HAARP is being used for nefarious purposes way beyond its capability, that Prince Philip and the Pope are engaged in trafficking drugs and children, that global warming is a hoax perpetrated by Jewish bankers and that there are lizard men disguised as humans who roam the earth. BTW - there are numerous sections in the AR5 report in which contrails are discussed - 44 mentions to be exact. "Aircraft" has 42 mentions. Scientists are not ignoring them. Thanks Sou - good to know they are not being ignored. I realise the CO2 emissions are not high from planes as the German study showed - however they seem to be adding to the overall problem of warming which is concerning. I know what you mean about the extreme beliefs of some and it is easy to call them Kooks. But in the absence of answers to the many questions society has about the state of the world, it is not surprising that conspiracy theories thrive. However if there was more mainstream access to information about what we are doing to our planet in general, people could make better choices for the future. In saying that, there is a rising tide of people seeking the truth about these things and genuinely wanting our world to be a better place. Like me waking up one day in 2012 and thinking “I have never seen this in the sky before, what is going on? That question remains - what has changed in aviation fuel in recent years to cause such long and persistent trails from any given single plane? And who will do the investigation, and when will clean energy be used for aviation? My husband who has a science background, and keeps up with current science, is equally concerned. I don't think that anything has changed over time except the number of flights has been increasing. I live under a flight path in a rural area, so have seen this effect for many years. I'd argue that there is nothing new in the effect itself, just in the number of flights - which means more contrails. So I suspect you woke up in 2012 and noticed for the first time something that's been pretty much the same for years. It happens. The other thing that might make a (tiny) difference is the fact that there is more water vapour in the air because of global warming. Or maybe you are seeing a change in the wind/air movement at that altitude, which would disperse contrails or not, depending. When we get lots of highs the contrails hang about for longer. When a front moves through the contrails disappear. Along with the "rising tide" of people "seeking the truth", there is a rising tide of people spreading disinformation, which makes it harder for those who don't know how to access or understand the science itself but not impossible and not even difficult. The science is way more accessible than it used to be and climate science is arguably the most accessible of all sciences. Contrails were a major bane to filming westerns in Monument Valley in the fifties. In WW2 the piston powered bombers had contrails at 20,000+ ft. It is not new. It is just as absurd to ignore CO2 because it is a colourless invisible gas as to point at contrails of frozen ice crystals because we can see them! I am far more worried about the few micron sized highly carcinogenic or mutagenic particles emitted especially by diesel engines. These particles have the most carcinogenic molecules on their surface known to science. What makes them very dangerous is that these particles can get deep into your lungs. A perfect delivery system for very nasty carcinogens. Asbestos micro fibres are totally inert yet being smaller than a cell can mechanically enter and then stimulate an already mutated cancerous (due to diesel particles) 'dormant' cell to proliferate. Oh dear. where to start. 1. The phys.org story had this line. "show that the contrails created by airplanes are contributing more to global warming that all the CO2 that has been caused by the entire 108 years of airplane flight." "It is important to note that contrail cirrus have a much shorter lifetime than long-lived greenhouse gases. This difference in lifetime influences the relative importance of contrail cirrus and other forcing agents for climate change when estimating their impact for remote time horizons"
2. The forcing by contrails was measured to be "range approximately between 10 and 80 mW m−2 for the year 2005". Consider that the forcing by "emissions of well-mixed greenhouse gases (CO2, CH4, N2O, and Halocarbons) for 2011 relative to 1750 is 3000 mW m-2". So any changes in temperature from contrails is orders of magnitude insignificant. 3. Skywatcher wrote "As an artist I have photographed the sky for the last ten years and have found no evidence of these trails till I saw my first one April 2012 - I have not stopped photographing them since. If this is not geoengineering what has changed in jet fuel and why? " Contrails have been around since before WW2. I live in Canberra, and the contrails that I see haven't changed at all in the 15 years that I have lived there. Contrails is NOT geoengineering. Nothing has changed in jet fuel. The contrails are just clouds, and are the same they have always been. "I have never seen this in the sky before, what is going on"
I can't explain why you seen to think that you are seeing something new, when there is nothing new to see. The contrail persistence time in the atmosphere hasn't changed. This is probably why those who think differently, despite all the evidence, are considered kooks. Hiya. Couldn't resist the non de plume, given previous comments. Had a question about the AMOS presentation. From what I can gather from online sources, the current emissions trends seem to mean that the IPCC's "low" emissions scenario (B1) can be ruled out for prediction, and that may well apply to "medium" (A1B) as well. However it's a bit hard for most people to tell what is currently the most likely emissions scenario, and therefore the most likely predictions for changes. The CSIRO State of the Climate Report still seems to be prevaricating somewhat with regard to emissions, stating that this or that may happen with whatever emissions, but not really giving a solid indication of what we can reasonably expect to be locked into. Question is: did the AMOS presentation, or question time afterwards, give any strong indications about what emissions scenarios are the most likely? RCP8.5 - the trajectory we're tracking - along the top! Other than that - maybe someone else who was there can comment. Ok, thanks for that. I had to read up on RCP's since they were new to me. RCP 8.5 is clearly shorthand for "We're f**ked" (I have some knowledge of the likely effect of those concentrations). Chances are people will take notice once they start cooking, so as long as some action is taken before the hysteresis makes mitigation impossible it may be possible to get a result of RCP 6 or 4.5 (roughly equal to B2 or B1 under the old IPCC scale). We'd better keep our fingers crossed for RCP 4.5. ....this would mean you should assume things will probably be a bit worse than the medium emissions/50th percentile option. BTW: personal opinion warning, and nothing to do with climate science. I'm finding your blogs interesting, but IMO the Rock Salt font makes for rather illegible headings. I often have to look at them two or three times before I can figure them out. No idea if anyone else has the same problem. One possible reason for more contrails is that the latest generation of commercial jets flies at higher altitudes than older generation jets as a result of improvements in wing design (?). Flight levels of 47000 feet (FL470) or over 14000m are becoming more common on longer flights. Personal experience seems to suggest that FL410 or over 12000 metres are now the norm for flights around two hours but that's an educated guess. Vertical spacing minimums between aircraft above FL410, mean that flights are allocated every 2000 feet or 600 metres up to FL470. I'm not sure, but I think that commercial flights at or above FL510 are not feasible (yet) i.e. if there is cabin pressure failure the dropdown breathing masks are rendered useless at that height. Contrails over Perth, Western Australia, are not very common but can be individually connected to the small number of commercial flights that pass over that city. There are photographs and an exposition on chemtrails on http://www.lifeonperth.com/contrailsoverperth.htm that may be useful.